As the rate of mobile internet use in China reaches 37%, it gives birth to many unexpected changes. For example, mobile payment has taken over nearly every cash scenario. Citizens no longer need a personal bicycle because there are tens of thousands of shared bikes on streets for everyone to use. Kids are used to online education. You can finish around 95% of service requests with apps, wherever and whenever you want. Mobile-based charity makes every citizen able to help people any time and any place. Behind all of this is Chinese business innovation and growing AI technology in the mobile age. As the organizing partner of four sessions about innovation in the Far East, GeekPark is proud to be deeply involved in bringing the top trending Chinese tech and AI companies to SXSW 2018. Not only will these businesses discuss the Chinese market, but they will also give a new perspective on global business. 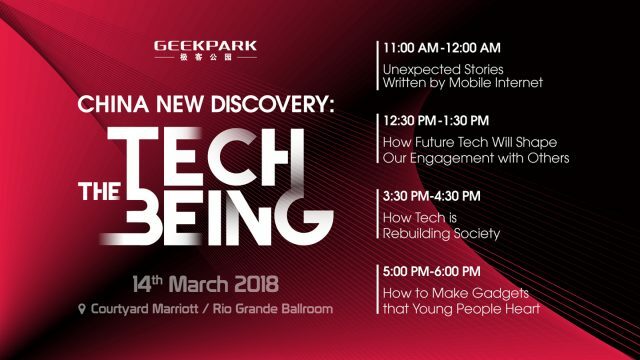 You won’t want to miss the exciting panels on March 14 at the Courtyard Marriott, Rio Grande Ballroom featuring speakers from GeekPark, ofo, VIPKID, Lizhi, Sugr, XPENG, eyemore, Tencent Foundation, Kuaishou, XGIMI and Makeblock. 5:00PM-6:00PM How to Make Gadgets that Young People Heart?